I've taken more of an interest in butterflies and dragonflies when out birding in the summer months especially since using a Lumix FZ45 'bridge' camera over the last few years. Focus will always be on birding and seeing any Lepidopteta and Odonata in the vicinity will be a nice diversion should the opportunity arise. However, a few times I've deliberately twitched them, the last being this Spring Bank Holiday weekend. 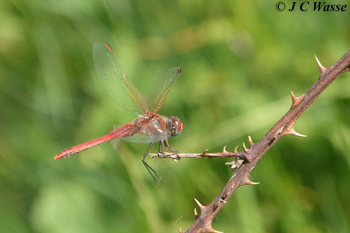 Inspired by Penny Clarke's Norfolk update on the Friday eve noting several Red-veined Darters in Norfolk, I took in Kelling Water Meadows the following day on the what you could say indirect route home for the long weekend in Yorkshire. I've come across this species in Cyprus and Germany, but always wanted to see them as a UK 'rare'. Not to be disappointed as on this sunny yet windy Saturday afternoon at least 2 males sunned themselves sat out of the wind on favourite thorny snags by the path skirting the northern end of the big pool. This was not a million miles away from the bush that held my only Radde's Warbler to date, way back in October 1991. The scarlet visitors put on a good show, as can be seen below, unlike that skulking Phyllosc. 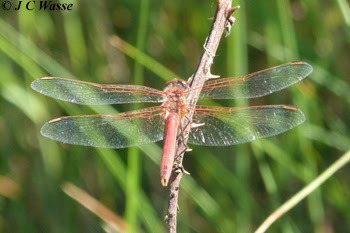 More photos of this ilk updated at the 'Dragonflies' page and other updates at this page and also at 'Butterflies' are of images from a recent trip to Cape May, New Jersey. 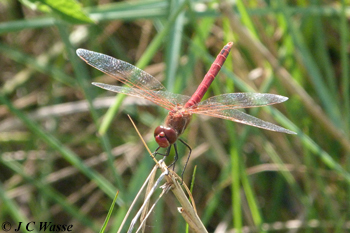 Birding trip report to follow but some images uploaded including Swamp Darner, Common Buckeye and Red-banded Hairstreak. Enjoy.